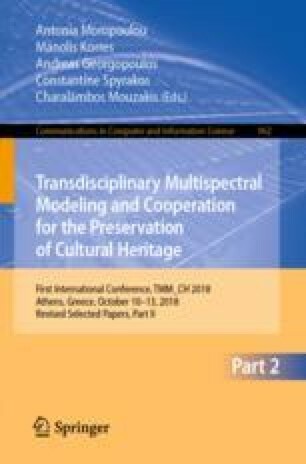 In this paper, the techniques of high-frequency ultrasound and infrared imaging are combined to enhance the sub-surface characterization of cultural heritage artworks. Initially, these two different modalities are studied independently focusing on the extraction of an art object’s stratigraphy through acoustic microscopy and the distinction of materials, such as pigments, via their infrared fingerprint. Moreover, post-processing procedures are utilized separately for each technique to maximize the information of the acquired data. Then, robust registration methods are presented and applied on the images in order to align them spatially facilitating their fusion. Finally, the entire process is summarized in a block diagram and the fused images are presented, revealing the enhanced perspective of the artwork’s sub-surface details. This work is part of Scan4Reco project that has received funding from the European Union Horizon 2020 Framework Programme for Research and Innovation under grant agreement no 665091.